My 11 year old nephew was visiting us and while John worked on Saturday I got to hang out with him. 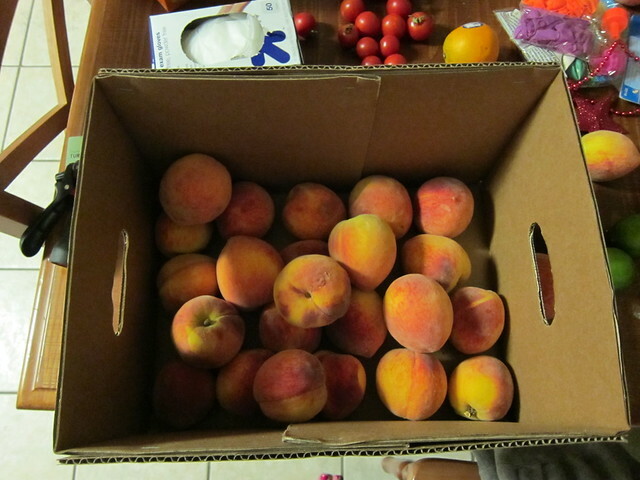 I'd been wanting to go and pick peaches in Fredericksburg for awhile so I thought, hey free labor, let's go! I decided to turn it all into peach jam. Seriously if you've wanted to make jam, but thought it'd be too much work, it's not. 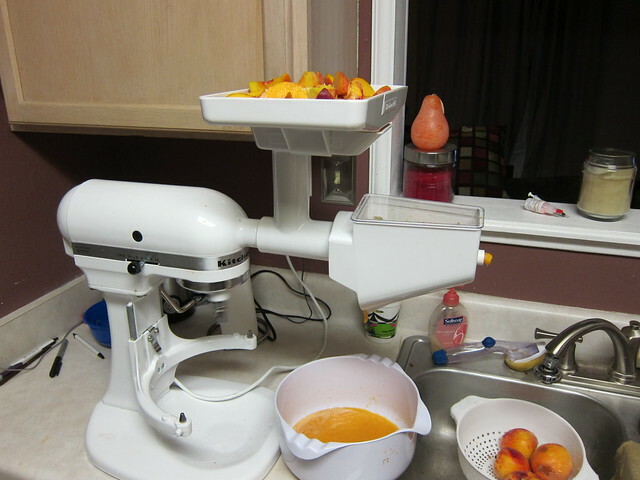 Plus I cheat and with my fruit and vegetable strainer on my KitchenAid it makes things like jam and salsa totally easy! Basically the strainer removes the all the seeds (not peach pits) and skins from fruit or vegetables for you. All you have to do is cut the fruit in small pieces and throw them onto the food tray. I usually catch the skins and run them through a second time especially if what I'm running through it is pretty juicy. Otherwise they pile up nicely to throw into the compost or in my case feed to the chickens. It turned three batches of jam into about 2 hours of work. 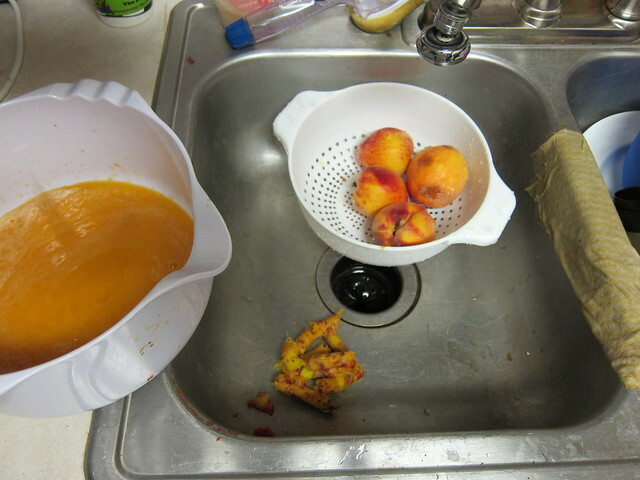 There was no boiling and then skinning the peaches. I just ran them through. Plus most of the time was spent waiting for things to boil which is usually how canning goes. And this jam? YUM! I thought my strawberry was amazing - it can't compete! 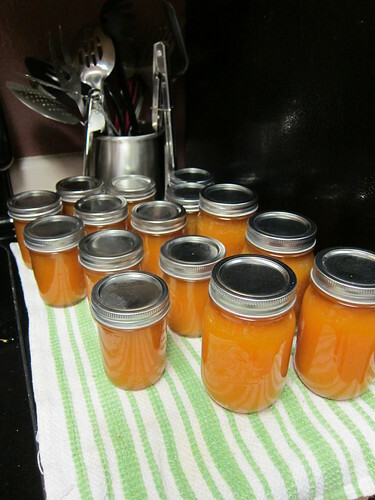 Something I found out - it doesn't take many peaches to make jam. Only about 10 per batch. I didn't even put a dent in the box we picked. 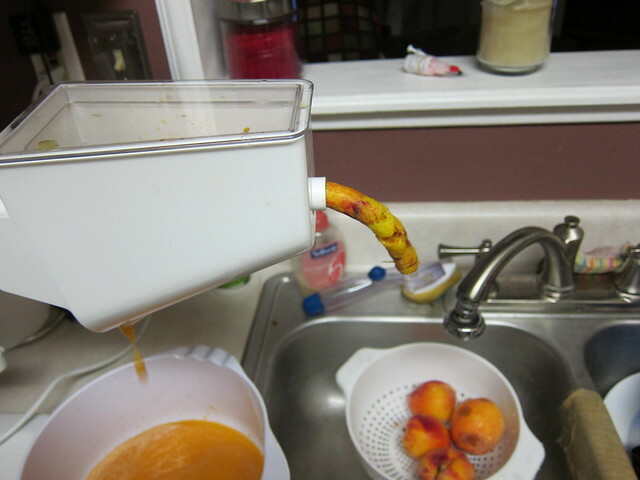 If skinning and dicing them yourself boil the peaches for 30-60 seconds and then throw them into a bowl of ice and water. The more ripe they are the easier to peel. Remove skins and pits and then dice. You could also throw them into a pot and hit them with an immersion blender. In a large, deep stainless steel saucepan, combine peaches and lemon juice. Whisk in pectin until dissolved. Bring to a boil over high heat, stirring frequently. Add sugar all at once and return to a full rolling boil, stirring constantly. Boil hard, stirring constantly, for 1 minute. Remove from heat and skim off foam. Ladle hot jam into hot jars, leaving inch head space. Remove air bubbles and adjust head space, if necessary, by adding hot jam. Wipe rim and center lid on jar. Screw band down until resistance is met, then increase to fingertip-tight. Also - my new canner I bought for my flat top stove that was really just an aluminum tamale steamer. Yeah. It crapped out on me. The bottom basically couldn't take the heat and actually went concave. John had fun beating it up with a baseball bat. I probably could have made another 2 batches of jam had this not happened. (Plus it's delicious so I'd love to have a huge stockpile in addition to what I've given away) Well after I posted my sad story on Facebook my oldest brother has bought me this lovely new stainless steel flat bottom canner. I have to repay him with salsa and hopefully my garden will cooperate so I can do so. Can't wait to get it and try it out!